An elegant custom commercial wine display is a striking addition to any hospitality establishment, (like hotels and restaurants). 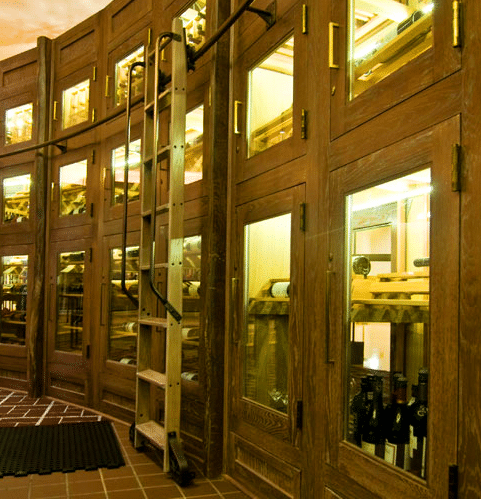 Commercial wine cellars Chicago provide an aesthetically pleasing space wherein restaurateurs and hoteliers can present their finest selection of vintages to their customers. Hospitality wine storage not only functions to provide maximum storage capacity, but also as a showcase area, where the best wines may be put on display. 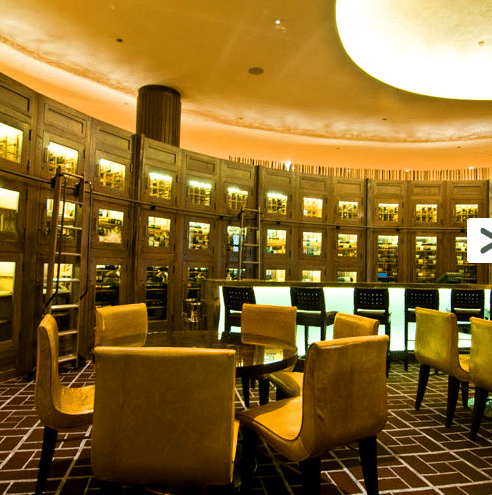 This stunning hospitality wine storage space was designed and built for the Fairmont Chicago Hotel at Millennium Park. 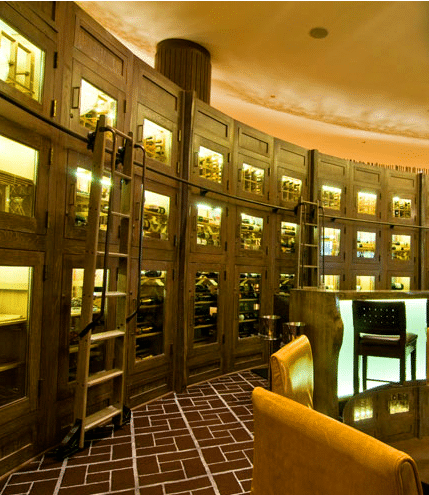 This eye-catching commercial wine display has a total storage capacity of 858 wine bottles. It includes regular wine bottle storage, chocolate and cheese storage, and individual wine lockers for guests. The designers at Wine Cellar SPecialists installed a row of commercial wine displays behind the bar and on the other side of the entrance of the round lobby, creating a magnificent wine showcase that could be viewed from all angles. The 10-foot wine cabinets are constructed from white oak with stain and lacquer finish, while the custom wine racks inside the cabinets are manufactured from unfinished mahogany. 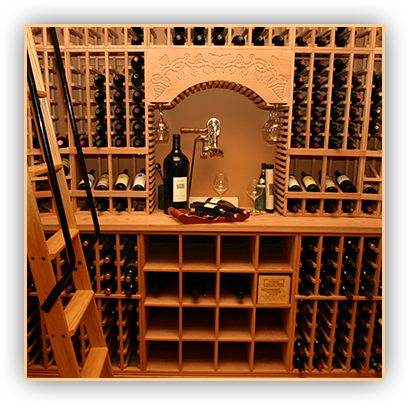 Commercial wine racks Chicago are essential components of proper wine storage. Wine racks not only provide the most efficient storage system, but also create the most stunning commercial display solution for a large selection of wines. 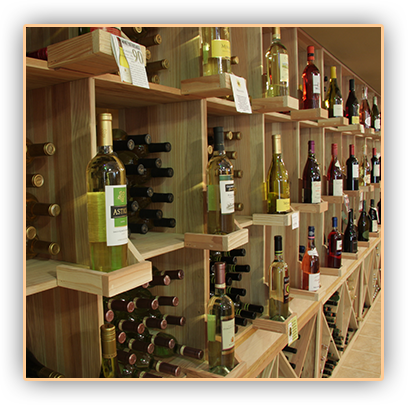 Commercial wine racks are designed to be more durable and sturdier than regular wine racking solutions, in order to withstand constant use. The right combination of commercial wine racks creates an efficient wine storage method that provides maximum bottle capacity and effective wine display. There are a variety of commercial wine rack styles available that will help create stunning restaurant wine displays, potentially increase revenue. The design team at Wine Cellar SPecialists provides their clients with a free three dimensional drawing of the proposed wine cellar project. A 3D wine cellar design allows customers to visualize the finished product, as well as make design modifications before wine cellar construction takes place. A three dimensional design package includes a floor plan, and different elevations of the area, as well as the total bottle capacity of the storage space. A floor plan is an overhead view that shows the arrangement of spaces of a particular area; in this case, the round lobby. An elevation shows how one façade of a building is viewed from one side. For this commercial wine cellars Chicago project, the different commercial wine displays are presented in the illustration as elevations A, B, C, D, and E.
All commercial wine displays have glass doors that provide customers an unobstructed view of the different wine bottles, cheeses and chocolates that are on display. Elevations A and E are similar in terms of storage capacity and wine racking solutions. These cabinets have two glass doors each, separating one compartment from the other. 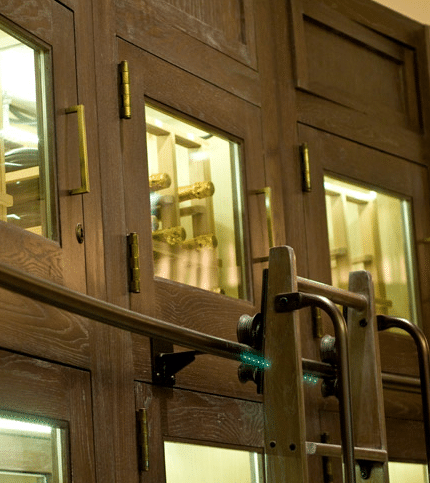 The top part of elevations A and E consists of secured wine lockers, that can accommodate 25 bottles of 750’s. The bottom half of the cabinet features five levels of double horizontal waterfall commercial wine racks Chicago, in lattice design that allows for the label forward orientation of the wine bottles. The horizontal placement of the bottles not only maintains cork and wine contact, but also promotes ease of product recognition and bottle selection. Elevation B has three glass doors that provide separate storage areas. 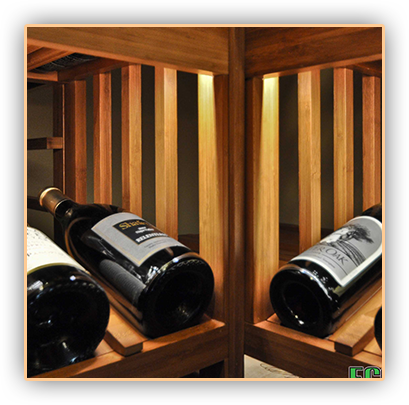 The topmost part of the column is a wine locker, wherein guests can store their favorite wine bottles. Just below the individual bottle storage are two levels of double horizontal waterfall commercial wine racks. The lattice style waterfall racking promotes better air circulation in and around the bottles, and adds character to the storage space as well. Since this section is situated right behind the open bar, the bottom door of this particular wine cabinet provides a space for open bottle storage, where the bartender can store and easily access his open wine bottles. Elevation C is designed to provide storage for different varieties of wines, as well as chocolates. The top two sections of this column are intended for bottle storage. The top compartment is a secured locker, with single bottle commercial wine racks Chicago. Additional bottle storage is provided down below. Two levels of double horizontal waterfall racking allow for the label forward display of wine bottles, for easy identification and perusal. The bottom half of the column provides an area where different selections of chocolates are displayed in a lattice-style shelf. This particular wine cabinet features two split systems, that allow for separate cooling zones for wine and chocolate storage. Having two separate split cooling units helps maintain the ideal temperature levels for each commodity. Elevation D is similar to elevation C. The only difference is that the bottom half of the wine cabinet holds cheese instead of chocolate. This column features a separate split system for each storage compartment, to allow for the proper regulation of the cooling temperature for wine and cheese storage. 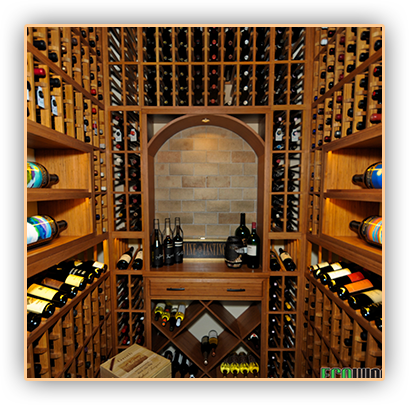 At the base of each wine cabinet is a pull out drawer that provides additional storage for miscellaneous items. This area is uncooled, and designed for dry storage. To provide a customized look and add functionality to this commercial wine cellars Chicago project, the designers installed a rolling library ladder, constructed from finished oak, which provided easy access to hard to reach areas. To help achieve and maintain optimum storage conditions, the design team at Wine Cellar SPecialists installed a ducted split cooling system. A split system separates the evaporator unit from the condensing unit, which promotes ultra-quiet operation and efficient cooling. Split wine cellar refrigeration systems can be either ductless, or ducted. Ductless split systems use a refrigerator line set (consisting of electrical wiring and copper tubing) to connect the evaporator unit to the condensing unit. A ducted split system makes use of air ducts to distribute chilled air into, and remove warm air away from, the storage space. For this particular hospitality wine storage project, each wine cabinet features an 1800 CC evaporator unit, which is placed behind the panel that is located on the topmost part of each cabinet. Cool air is distributed into the cabinets via an air duct system that is ducted through the ceiling. The Fairmont Hotel Chicago commercial wine display provides a magnificent and elegant showcase of the finest wine bottles. It is also a testament to Wine Cellar SPecialist’s years of experience in designing, assembling, and installing climate controlled commercial wine cellars, that provide the best environment for storing and aging wines and create the most efficient storage and display solution.